Originally published in 1907 and republished in 1983, the work commonly called Burke’s History has become a rare collector’s item over the years. Due to its scarcity, Rosemary Donovan of the BookMarket bookshop decided to issue another reprint and this was launched in the Main Guard on 24th November 2010 by the Mayor Siobhan Ambrose. It has taken nearly a year to organise it, and Rosemary stated that she felt it was important to keep as much work in this country as possible so the book was printed in Ireland. Margaret Rossiter, well known local historian and columnist with the Nationalist newspaper wrote a new foreword to the book, and was also at the launch. Canon William Burke’s history has long been recognised as the definitive work on the town of Clonmel. The name Burke has many associations with Clonmel, the most recent probably being the Burke’s bacon factory. 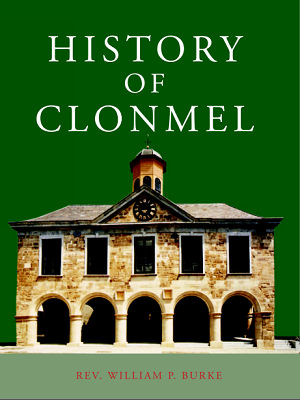 May I know the name of the publisher of History of Clonmel. Also, where can I obtain a copy of The Tower Houses of County Tipperary by Conrad Cairnes, 1984? i ave 1 of the reproduction books there were only 800 made. mine is no 613 any idea what it would be worth.